An abandoned train in Seward, Alaska? Yes, this happened. In June of 2016, we traveled to Alaska to photograph Sheryl and Rob's once in a lifetime wedding! 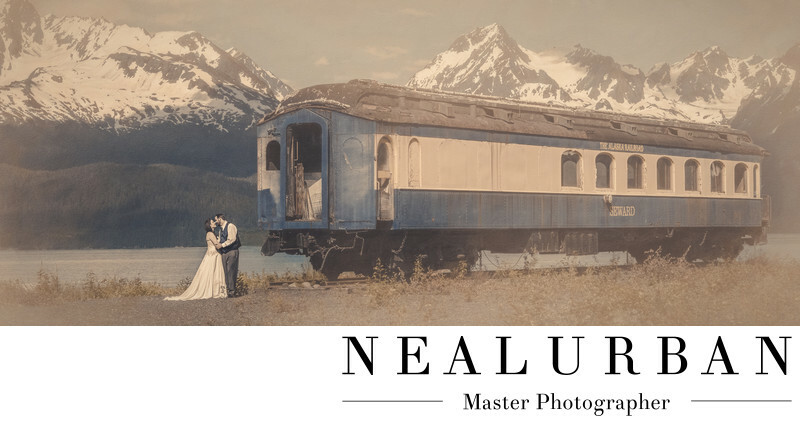 This was a top location for Neal to photograph a wedding! The drive to Seward was the ticket! An amazing coastal drive with so many photo opps on the way. We followed Sheryl and Rob in a separate car and mapped out some locations we wanted to stop at on the way back to Wasilla. We did this because the lighting would be much better on the way back. This entailed making notes to stop by that roadway sign that had the number 42 on it because the scenery would be amazing. Let's just say we had to do some improvising! It was very hard to pinpoint each location on a 3 hour drive! We happened to stumble upon this train by chance. Rob's family had a camp site in Seward where they were both going to change into their wedding attire. Neal decided to take a walk around and saw this abandoned train. Time for a detour! It was not the best time of day for lighting. The sun was beating down, so we had to bring in some external light to fight the sun. No problem! Except Neal had to find the best vantage point to capture the entire image. We had to maneuver our rental car so Neal could stand on it for the shot. No big deal! We even had a few campers asking if we needed assistance. What nice people! Alaska was the most amazing destination for a wedding! It was another dream come true! We were so nervous at first about flying that far. Good thing there are tv's on planes now, or it could have been a long flight! Location: Lowell Point Seward, AK 99664.